"What you are seeing is only a drop, one raindrop containing a sample of what remains of the millions of lives lost in these camps." These were the words occasionally repeated by our Polish guide during a visit to the former concentration/extermination camps of Auschwitz and Birkenau. This was the most difficult but most profound aspect of my recent trip to Poland. After teaching a yoga intensive in Warsaw, I traveled to Krakow and then took a day trip to Auschwitz/Birkenau. My experience teaching in Poland was incredible, and I will return again next summer, but my visit to the camps is what I am choosing to share right now. Having read about the Holocaust and seen many excellent films depicting the horror of life and death in these camps, nothing quite prepared me for the experience of being there, and seeing and feeling the earth and air of this place. It was very cold late March day when we went, it had been snowing the day before (it snowed pretty much every day of my two weeks in Poland) and was overcast and blustery, especially at Birkenau. 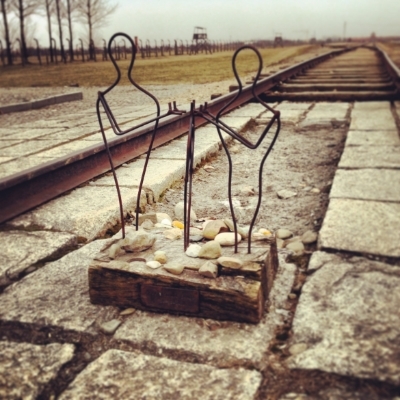 Birkenau is the largest of what were the three camps of Auschwitz (usually referred to as "Auschwitz 2"). It is a huge, stark, and exposed plain surrounded by a forest of white Birch trees (hence the name Birkenau) and was the site of the some of the most horrendous living conditions and mass extermination facilities during the war. Since so much is simply incomprehensible and indescribable, I will share only a few verbal and visual images. My traveling companion Jen Roy took these pictures (she took very few pictures at the camps) but captured very well some of the small things that were emblematic of this "raindrop" described by our guide. It was difficult to see the hair braids of the small girls, and the eye glasses and shoes, hair combs, hair cream, and tooth brushes, cookware and precious valuables by the thousands that were displayed in the museum. These small artifacts were pieces of what was once a part of someones world, "just a drop" in a universe of families, perhaps full of hope of setting up a new life somewhere. There were rows upon rows of photos lining the walls of the museum. Many photos of the faces of those young and strong enough to be worked for a few weeks or months before losing their lives. With their heads shaven, and their eyes open, these pictures spoke volumes and were heartbreaking to view. And there are no words capable of describing the photos of the emaciated and mutilated bodies of the children used for medical experimentation, or the emaciated bodies of the few beings that had survived long enough to see these camps liberated. And then there was the remnant of a single rose, only the dried up stem and leaves still present, that a visitor must have left on what was once a long row of exposed concrete holes that were part of a mass outhouse. The prisoners were allowed a few seconds a day to use these holes to relieve themselves. Most of the time they were not given any facility for this purpose. Of the many jobs those prisoners strong enough to work were given, the job of cleaning the bottom of the latrine pit was a considered one of the best. It was good job since the outhouse was covered and somewhat protected from the elements. The remnants of that rose so tenderly placed on what was once a toilet was gesture of so much respect, a little flower of dignity placed over a site of intended humiliation. And another rose recently placed (its bud still intact) in the padlock of a freight car used to lock in and transport people for what must have been hundreds or even thousands miles from their homes and homelands to this stark and desolate place. The railroad tracks at Auschwitz/Birkenau are a cold hard steel, a distillation of the unimaginable. These tracks made by humans, used by humans represent both a cruelty and a utilitarianism utterly lacking in humanity and empathy. And yet, here in the soil and in the air, and in the roses so tenderly placed, one can feel the presence of so much humanity. In hearts and minds of the survivors, descendants, and fellow human beings who visit this place to bear witness, remember and respect the honor the dignity of all who lived and lost their lives here, is a drop of humanity. Maybe just a raindrop, or a teardrop, or a rose, but still a drop of dignity in this incomprehensible sea of utter depravity. It was a harsh reminder of the importance of recognizing the innate dignity in everyone, and how essential it is to cultivate empathy and an experience of relationship with our fellow beings as unitive, rather than separative. And to look closely, very closely at all the little and perhaps insidious ways that we might (if only in our minds) denigrate, diminish, or even dehumanize those who are not like us.